Intermedia Global is one of the UK’s longest standing data services companies with a stable, highly experienced list management team promoting the brands that we represent across the globe by proactive sales techniques that generate high levels of extra income for our partners. We have generated considerable revenue year on year for our list owners, repeatedly counteracting market conditions and applying our strengths for identifying new markets and bringing new clients to utilise the unique brands that we represent. We have established a high profile and an enviable reputation for successfully launching substantial brand led B2B lists into the list rental market. We have a wealth of experience in partnering, developing and managing B2B databases. Clients include ECP/Bisnode, Euromoney, Informa, Harte Hanks and Progressive Media to name but a few. Take advantage of Intermedia Global being the UK representative of the Lists4Europe Consortium, which is a unique partnership of Europe’s leading and experienced database service companies. 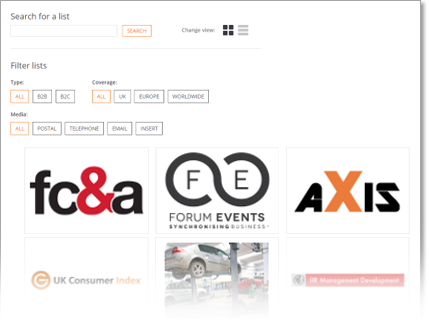 Lists4Europe offer’s List management representation across all European countries and other international markets, capitalising on revenue opportunities at a local and pan European level.